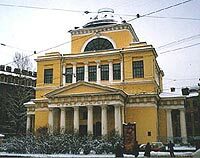 The building of the museum was created by the architect A.Melnikov in 1838. In November 1930 the museum was founded by the order of the Soviet Government as a Department of the Arctic Research Institute called the Arctic Museum, based on exhibits and material of"Polar Exhibitions"which were held in Leningrad, Moscow, Arkhangelsk during 1923. The doors were opened for visitors in January 1937. During the Second World War the museum was closed and evacuated to Krasnoyarsk, Siberia. In March of 1950 the doors of the museum were opened again for visitors. Since 1958, after the commencement of Antarctic exploration and research by the Russians, the new Department of Antarctica was amalgamated with that of the Arctic to become"The Arctic and Antarctic Museum"
In February 1998 according to a decree of the Government of Russian Federation the museum became "The Russian State Museum of Arctic and Antarctic." The Russian State Museum of Arctic and Antarctic is the only museum of its kind in Russia. It is one of the largest ones in the World devoted to the discovery and history of exploration, natural environment, and the economy and culture of the polar regions of the planet. It is the only one in the World having both Arctic and Antarctic expositions. Nowadays the museum collection contains near 75,000 exhibits of which many are unique and date back to the XVI century. During more then 60 years of its work the museum organized more then 300 exhibitions in Russia and internationally. During these years more then 6 million visitors enjoyed the collections of the Museum. The Russian State Museum of Arctic and Antarctic with its unique expositions become an integral part of the cultural life of St. Petersburg and Russia. The numismatic collection of the Museum contains 4000 pieces including the coins dated back to XVI - XVII centuries, honor medals used to award polar explorers of the USSR, Norway, the USA and other countries. A unique collection consisting of 15 medals to commemorate the 50th anniversary of Tchelyuskin Epopee and devoted to the polar pilots- the heroes of the USSR are also on display. One of the most interesting display of the museum is the Polar Philatelic Collection. So soon as people came to the Arctic and Antarctic the post offices were organized. Envelopes, Post cards sent from different expeditions became the important documents of the polar history. All countries participating in polar explorations issued hundreds of stamps devoted to the polar explorers and scientists, ice breakers and research vessels, the landscapes and wild life of the Arctic and Antarctic. These envelopes, post cards and stamps are involved in the collections of the world famous philatelists. Some of the best examples of the Polar philately are displayed in the museum.